For its 12th year, Elysian Brewing Company will move its Great Pumpkin Beer Festival to Elysian Fields and the North Lot of CenturyLink Field for one day only. During the pumpkin-themed event, more than 80 pumpkin beers will be poured, including Night Owl, The Great Pumpkin, Dark o’ the Moon and Punkuccino from Elysian’s pumpkin-crazed brewers, along with pumpkin beers from around the country. Also during the Great Pumpkin Beer Festival, the Elysian team will officially tap a giant, several-hundred pound pumpkin that has been scooped, scorched, filled with pumpkin beer and then sealed and conditioned for all attendees to enjoy. Guests are encouraged to embrace the color of the festival – orange – in any way they would like to represent. Pumpkin Fest judges will wade through the crowds to select the most festive to win a thirst-quenching prize. The event arrives one week after Elysian’s 2nd annual Great Pumpkin Weigh-Off on October 1st. Free and open to all ages, the event will feature the biggest and best pumpkins grown from the local farmers, and the winning pumpkin will receive the honor of being tapped at GPBF. Tickets are $28 per person and will be available for purchase for those 21+ at all four Elysian locations and online starting Aug. 1. A designated driver ticket is available for $5 per person online only. Saturday, Oct. 8, 3 – 10 p.m.
4,000: Costume-clad beer lovers packed Elysian’s Georgetown location during last year’s 11th annual festival that spanned over two days. pumpkin beer, and tapped for all festival goers. 80+: Number of pumpkin beers poured at the festival. More than 20 of which are unique Elysian beers. 60: Participating breweries from around the U.S. brought to the festival. Night Owl (6.7% ABV; in 12 oz. 22 oz. draft) – A very drinkable pumpkin ale—brewed with seven and a half pounds of pumpkin per barrel and spiced in conditioning with ginger, cinnamon, nutmeg, cloves and allspice. TheGreat Pumpkin (8.1% ABV; in 22 oz. draft) – Pours deep copper with ghostly white head. Intense pumpkin, sugar and spice on the nose with a nice bready and malty backdrop to tame all those autumn spices into a remarkably smooth, balanced and delectable fall treat. Extra pumpkin and roasted seeds are added to the mash, kettle and fermenter. Spiced with cinnamon, nutmeg, cloves and allspice. Dark O’ TheMoon (7.5% ABV; in 22 oz. 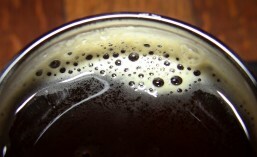 draft) – Pours dark as night with a creamy tan head. A slight smokiness on the nose with malty bittersweet chocolate and a little coffee with subtle earthy pumpkin and spices for an overall nice and creamy mouth. Punkuccino– (6% ABV; in 22 oz. draft) – Beer and caffeine. Why not? A pumpkin ale with the attitude of a world-weary barista, Punkuccino packs a short shot of Stumptown coffee in your pint with just a shake of cinnamon and nutmeg. It may only be early August, but don’t delay in purchasing your tickets. The Great Pumpkin Beer Festival often sells out and, in previous years, once sold out there are no more tickets available at the gate. Start preparing your orange/pumpkin themed outfit as well, to earn recognition and prizes. This entry was posted in Ale, Awards, Beer, Beer Garden, Beer Ingredients, Brewing, Contest, Craft Brewery, Events, Fall, Festivals, Food, Holiday, Holiday Beers, Local, Music, On Tap, Prizes, Pumpkin, Seasonals, Seattle, Series, SoDo, Sours, Summer, Taps, Tasting, Washington, Washington Beer and tagged 2016, August, beer, Elysian Brewing, Great Pumpkin Beer Festival, October, seasonal, seattle, SoDo. Bookmark the permalink.